When people see our SmartCells they often ask “What’s inside the triangles?”. The answer to that is really quite simple and short: “air”. To be precise however, the SmartCells aren’t ‘triangles’: the shape is officially called a tetrahedron – not quite a triangle, also not really a pyramid but a combination of those two. So Vicair is all about packaging air in a unique way, in each of our cushions you will find hundreds of these small packages of air, hundreds of SmartCells. It all started with an invention by Huibert Pollmann in the Amsterdam Rehabilitation Centre. He believed that in order to sit comfortably in a wheelchair you need high quality pressure redistribution and stability, and he thought air was the best way to achieve this. His vision included separating air into small packages that can move alongside and interlock one another, resulting in optimal pressure redistribution and stability – the idea of SmartCells was ‘born’. The foundation for SmartCells was laid by Huibert Pollman, but after this a new challenge arose. Overcoming one of the most common problems encountered with wheelchair cushions that are based on air: creating the air packages in such a way that they would not leak air, not even when used intensively. This is when Max Rogmans, the CEO of Vicair, came into play. He was convinced of Huibert’s concept and believed that it could work well. Max succeeded in developing the air-cells in such a way that they would be able to weather intensive use without leakage: he created the very first SmartCell. This was followed by great success. In 1995 the new technology won the most prestigious award for inventors: The Grand Prix at the Salon des Inventions in Geneva. One SmartCell is just the basis, the biggest strength of the Vicair SmartCells is in their numbers. Whilst using a Vicair wheelchair cushion, you do not sit on just one SmartCell, but hundreds of them. One very basic benefit of hundreds of SmartCells is that if one cell would happen to leak air, the wheelchair cushion still retains its function. This is why Vicair wheelchair cushions last for years on end. Not just a smart but also a safe idea. Next to safety all the SmartCells together form layers within the compartments of our cushions. Within the compartments they are able to move with so little friction that they resemble a viscous fluid, enabling the cushion to adjust to the shape of your body. Additionally SmartCells are able to deform individually to conform to your body’s contours. All these facets together result in superior pressure redistribution. 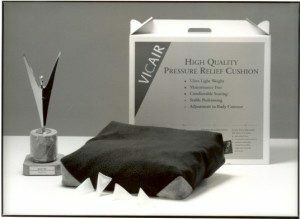 You can easily recognize a Vicair cushion by its tetrahedron shaped Vicair SmartCells. Over the years Vicair has continuously been developing and optimizing the SmartCells. The current SmartCells are even softer than their predecessors to further enhance the user comfort. 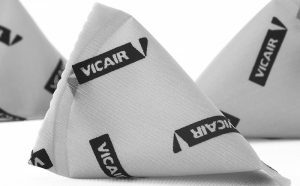 You will recognize the latest version of the Vicair SmartCells by their silver-grey exterior with a black Vicair print on it. The elements of our technology and product design combined provide you with a wheelchair cushion of exceptionally high quality. The smooth SmartCells move almost frictionless against one another, the cells in the compartments deform individually and together to adjust perfectly to your body. The cushion compartments are designed in such a way that they provide superior stability and therefore positioning possibilities. 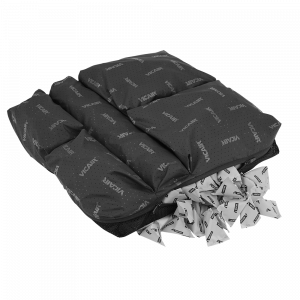 Each is filled with just the right amount of SmartCells, resulting in a stable Vicair cushion. Every compartment can also be adjusted to fit individual needs by removing or adding SmartCells. The final result is a wheelchair cushion that provides optimal pressure redistribution and minimal shear forces. A Vicair wheelchair cushion provides you with maximal comfort, optimal support and an overall smaller risk of skin breakdown.